UDM Downloads > CMSimple Content Management! 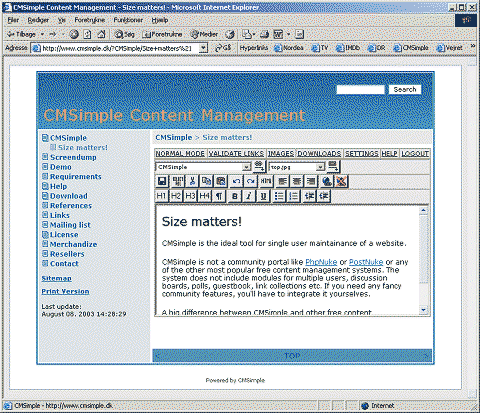 CMSimple is a simple content management system for smart maintainance of small commercial or private sites. Simple installation and easy to modify. The entire site is stored in a single HTML-file - there is no need of databases. If you prefer, you may edit your entire site in your favorite HTML-editor, upload the content file and get a dynamic website. The complete content management system is less than 50 KB. Integrated WYSIWYG online editor (both IE and Mozilla), link validation, image handeling, online editing of system files and automatic backup on logout. CMSimple is Open Source under the Affera General Public License (AGPL), and is copyright by Peter Andreas Harteg (with requirement to keep link to download site). A commercial license is available for around US$56 per site.